Where would scary movies be without fog? Was there ever a classic monster who didn’t spend some time staggering through a thick bank of fog on its way to terrify the townsfolk? Just about every car that’s broken down on a lonely country road just outside of a seemingly deserted mansion has been plagued by fog that makes it nearly impossible to see. Why, there have even been more than a few movies where fog itself was the monster. That’s a pretty impressive list of achievements for a cloud of water vapor. While it’s highly unlikely that the fog produced by this machine carries any monstrous intent, it’s just the ticket for setting a super spooky atmosphere. 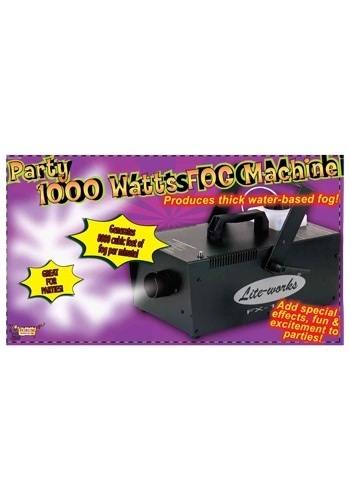 This compact fog machine (18" x 7.5" x 5") can produce 4,000 cubic fog per minute (fog liquid sold separately). It’s safe for indoor use and plugs into any standard outlet, making it an ideal accessory for Halloween parties, haunted houses, or any other event that can use a little touch of that monster movie creepiness.